It’s here, guys. It’s the week before we see Charles’ FACE. WE COME FACE TO FACE WITH A. Let’s not even dawdle. Let’s get right into prom. The episode opens with each mom telling the girls just why the school feels that it’s not safe for them to attend the prom. (That seems to go against A’s plans according to the last scene of last week’s episode where he and Red Coat handed off tickets for the magical night.) The girls are obviously really angry that the school feels they’re a risk to everyone else. But... guys. Duh, it’s prom. And it’s not just the night of formal dresses and flower arrangements. The girls discover they aren’t even allowed at graduation either. That’s just rude. As Hanna said before, the girls simply can’t win. A is always taking away from them. When the Liars meet at the coffee shop to discuss their double ban, Ali is off in her own world, seemingly miles away from the conversation. She doesn’t seem as upset as the other girls and says that it’s not like she would even go to prom. It's not like they have friends apart from each other. Which... true. After Aria makes a comment about Charles and Ali gets slightly upset, Emily changes the subject and asks if Aria’s talked to Clark. She says that she’s been texting him and leaving him messages but that he hasn’t answered her. Lorenzo walks in and gives Ali a pretty cold look. Ouch. As she walks away to “go to the bathroom,” but really get away from the awkwardness, Ali's phone chimes and she gets a text from Charles telling her to go to the prom and that she better be alone. Of course, she doesn’t share this with the other girls. That’s a smart idea. Good job, Ali. Ugh. Aria leaves yet another message for Clark and pleads for him to call her back. Ezra overhears her doing so and tells her that it’s better she leave that up to the police to deal with. Ella enters in that moment and tells Aria that she’s won the first prize in the photography contest. YAY, ARIA! You finally get the chance to get out of Rosewood! You fly out right after graduation, pretty much! YAY! But Aria is more worried than both Ella and Ezra about what will happen if she leaves and A isn't caught by then. Aria’s being slightly more pessimistic, honestly. She wonders aloud if A has a plan for the girls’ faux prom in the barn since, as she points out: “that’s where this whole nightmare started in the first place.” Ezra offers to be her date and it’s just so cute. He’s trying so hard to get her back and I’m like, JUST TAKE HIM BACK. Caleb is heading to New York to help his dad with something that he’s not giving exact details to Hanna about. She goes through his bag when he’s not looking because Hanna literally trusts nothing and no one anymore (smart girl). “Why are you bringing an industrial laptop?” she asks. Neither I nor Hanna buys Caleb's whole “my dad is turning into a techno freak” lie (it's such a BAD lie, Caleb). Meanwhile, nearby, Emily asks Sara to the prom because she’s randomly back. Okay, cool. I guess? But Sara says that she can’t go because her old school’s prom is that night and she told Claire that she would go. You know, because she’s been gone for years and they welcome her back with open arms without being enrolled. SEEMS FISHY, SARA. Toby is on his way into the police station when Spencer runs up and asks if there’s anyone she can talk to to fix his suspension since everything is basically her fault. Toby knows that there’s nothing that she can do. Whether he’s on the force or not, they’re close to catching A, and A knows that. Lorenzo walks out of the station and tells them that he is indefinitely suspended and that no matter what anyone says, that’s not going to change. Hanna calls Caleb’s dad to see if he’s lying because she literally can’t let anything go anymore. Calm down, Hanna. It’s not like Caleb has ever done anything that put you in real danger! Ashley comes into the kitchen while Hanna is on the phone, and asks Emily where Caleb (she also feels like something is up with him). Ashley genuinely feels bad for the girls and suggests that they go through with the faux prom anyway since it’s a once in a lifetime experience. Hanna is convinced that Caleb is off to hunt down A himself and that he’s going to get himself killed as a result. (Please tell me this isn’t going to give way to the Caleb is A theory my sister told me about the other day.) It’s too far-fetched for Rosewood’s Disney Prince. 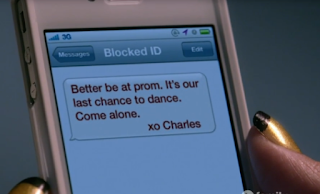 Ali gets a phone call from a blocked number while at prom and she tells (presumably) Charles that she won’t be at prom, that she can’t go to that school and hears nothing but a dial tone. Oh, and then A HOODED FIGURE RUNS OUT OF THE BUSHES BY HER WINDOW. Let's play a game: creepy or extra creepy? Lorenzo and Spencer meet at the coffee shop and Spencer explains that Ali’s plan wasn’t intentional but he... doesn’t buy it. All he’s heard since coming to Rosewood was how Ali was a master manipulator and how he had to stay away from her outside of his job. He feels used, but Spencer understands that better than anyone. She’s been used and manipulated more times than she can count by Ali, after all. But Spencer explains it was all because Ali was desperate. She has changed and has certainly never had anyone like Lorenzo in her life. She hopes that he can forgive Ali, but he says that he can’t yet. Spencer notes that if he changes his mind, they’re having a "promette" (what a cute name) where Lorenzo could surprise Ali,,, and maybe even himself. All four moms are meeting in the Hastings kitchen and discussing what could be done to protect the girls. They feel that the cops aren’t doing enough, but Ashley remarks that as long as they can stay awake to chaperone "promette" for the next three hours, they’re good. Hmm. Seems slightly foreboding, no? Because it’s not like the thunderstorm that’s brewing doesn’t feel like bad news already, AM I RIGHT? Ali is in the backyard and waves to the moms, but when they look away, she runs through the bushes and BOOM. There’s red coat waiting to follow her. Okay, aside from all of the drama, I have to take a second to talk about how gorgeous the girls look. I mean, their looks are totally unrealistic for a real prom, but for the purposes of Rosewood’s biggest risks, the more outlandish the better. Moving on. The girls are taking pictures and Hanna grills Toby about Caleb’s plans. He has absolutely no idea what Caleb is up to. Back in the house, the moms start to go to town on some wine and Veronica lets slip that Jason isn’t even Papa D’s kid! WHOOPSIE. Meanwhile, in the barn, Aria makes a move toward the table of cell phones and sees something pop up on Ezra’s. It’s a flight confirmation from Philly to LA the same day that she would be leaving. She doesn’t not seem super thrilled about this revelation. Ali walks into literally the most outlandish prom I have ever seen (which would also literally never happen in real life; WHAT KIND OF BUDGET DOES ROSEWOOD HAVE?) and starts looking around for any sign of Charles. There are too many red capes for her to locate the right one and it’s also because, it would seem, HE OR SHE IS RIGHT BEHIND HER. Let's play more of the game: CREEPY OR CREEPIEST? Clark is there, at prom, inexplicably taking photos. Or, you know, THE ENTIRE GROUP OF TEENAGERS YOU SHOULD BE WATCHING HAS JUST WALKED INTO THE REAL PROM WHILE YOU LADIES WERE GETTING YOUR DRINK ON. The whole group -- the Liars, Ezra and Toby -- arrive at prom and they’re on the hunt for Ali and any trace of A. Aria runs into Clark and she asks him a million questions like "what are you doing here?" and "how are you taking photos here when you’re in college?" and valid stuff like that. He doesn’t really answer her and she gets mad and tells him that the girls saw him walking into the doll factory. Before he can even say anything, a teacher comes up and rudely tells Clark not to photograph Aria and to go snap a shot of the ice sculpture before it melts. With a 'tude like that, it seems like she’s the ice sculpture, but whatever. The teacher looks Aria in the eye and tells her that her group should quickly find the exit. The girls finally run into each other and Ali feels like the Liars are scaring Charles away just like at the arcade. Ali’s allowing him a whole lot of wiggle room and compassion, and I’m like, "Remember all of those times he’s tried to kill you since you were born? Those seem like a ton of reasons to not trust this dude or go searching for him." Also, Sara shows up randomly at the prom, and that feels slightly sketchy to me? I mean, seriously. I can’t drop the fact that she was absent when Red Coat showed up. Meanwhile, the adult women walk into the DiLaurentis home and can’t seem to find Papa D. Emily’s mom sees an envelope on the table and say that it’s evidence from the police. When they open it, they see the picture of Jessica, Charles and Jason and just then RHYS COMES IN THE DOOR AND I’M LIKE "WHAT ARE YOU DOING HERE AT THIS EXACT MOMENT?" Spencer is trying really hard to stop Ali from seeking out Charles, but she can’t. Ali knows that Spencer has never liked her and all Ali wants to know is why Charles hates her, what she did to make him do all of this. Spencer looks just as bewildered as the rest of us. Caleb shows up at prom, looking all types of suave but is also being super cryptic about where he was. Not cool, bro. Back at the DiLaurentis house, Rhys asks the ladies where Papa D. is. He explains that he’s from the Carissimi Group, which Jessica was a supporter of, and that he has some serious questions for him. Ella stops Mrs. Fields when she tries to say something to Rhys, but he leaves. Ashley says that Hanna believes the group is linked to Charles and Ella says, “I think we just met Charles.” Good eye, Ella. Good eye. While Ali assumes that literally everyone in a mask is Charles (wouldn't you? ), Aria and Ezra, while dancing, have one eye on Ali and one eye on Clark. They wonder why Ali would take this Charles business so seriously. Spencer, meanwhile, is dancing with Toby and is confused as to why Ali would say that she didn’t like her when all they’ve been trying to do is protect her. (Sidenote: How did Toby become a cop without having graduated high school? Or did he and I just didn’t know? Someone figure that one out for me, please!) Sara, elsewhere, tells Emily that “whatever happens, you mean a lot to me.” WHAT DO YOU KNOW, SARA? IS THIS BECAUSE YOU’RE RED COAT? Of course these chit-chats and slow dances mean that they’ve all lost sight of Ali. Whoops. The moms are about to start looking for more clues in the DiLaurentis casa when they hear something coming from the basement. They go to investigate and when they’re all down the stairs, the door slams and locks behind them. Obviously. Now they know what the girls have felt like. Back at prom, Ali follows another red cape. Hanna is now fed up with Caleb’s aversion to conversation. Spill the beans already, sir! He tells her that he was in New York getting a job but that he can’t tell her much about it other than he keeps hackers out of the company (the legit company) he works for. It pays well enough that he can afford a place for them to live and her tuition. He’s the sweetest ever and my heart hurts and three cheers for Rosewood’s Disney Prince! The moms, meanwhile, are freaking out trying to figure out how to get out of the basement and who locked them in there when the lights go out. OF COURSE. Ali is walking through a maze of mirrors and twisted branches that is, for whatever reason, inexplicably in the MIDDLE of the prom (where did they have this? An open field?) and comes face to face with a cape and a ton more mirrors. Her phone chimes. “Now it’s just the two of us…” THEN CHARLES GRABS HER. DO YOU HEAR ME? HE GRABS ALI AND DRAGS HER AWAY. None of the group can find Ali and agree that splitting up is best. (False. Again. That's never the answer and yet you STILL KEEP DOING IT.) Back at la casa de DiLaurentis, the moms are still trying to get out of the basement and don’t know how the girls got through it all. Uh, yeah, Ashley. They went through way worse. Come on. You're in a BASEMENT. “We had one job tonight. One. To keep them safe.” FAIL ON YOU, TIPSY MOMS. Spencer and Emily find Ali’s phone on the ground while Ali is running down a hall with A right behind her. She turns around, he pulls aside the hood, AND SHE SAYS "OH MY GOD." BECAUSE SHE KNOWS HIM. DO YOU HEAR ME? SHE KNOWS WHO THAT PERSON IS. THERE IS NO OTHER REASON FOR HER TO HAVE THAT SORT OF REACTION. Okay, so what do we know? It isn’t Jenna, Lucas, Mona (she’s too short), Rhys (he was at the DiLaurentis house), any of the moms, Caleb, Toby, Ezra or the Liars. Sara made that cryptic comment earlier and I’m totally convinced she’s Red Coat, so who does that leave? I’m telling you guys. It’s absolutely Wren. There’s just no other way in my mind especially seeing as the entire episode happens at RADLEY. Who do you guys think is behind the infamous black hoodie? Who could be revealed and shock Ali like that? Is it just me or do we think Papa D. is definitely dead and probably in the basement somewhere? Let us know in the comments or over on Twitter @MissMeganMann or @JustAboutWrite_! I’ll see you next week for the summer finale and THE REVEAL OF THE PERSON WE HAVE WAITED YEARS TO MEET.